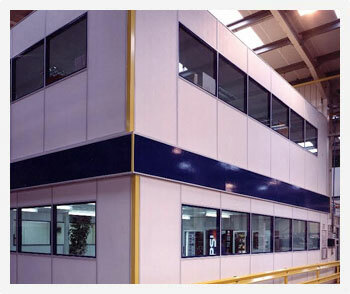 Mezzanine office floors can be the ideal, practical solution to increasing your available floor space. By installing a suspended ceiling or mezzanine floor, as well as office partitioning, you can expand your operations into an efficient and robust workplace, without having to relocate your business as it grows. Our expert team will carry out a full site survey, taking into account your budget, business requirements and current layout. Installation can be carried out quickly, to minimise downtime. Because a mezzanine level requires no structural support from the building itself, it can be dismantled and moved to new premises when required. We will ensure all necessary staircases, handrails, gates and lifts are installed for convenient and safe use, in line with building regulations and your individual needs. For more information, get in touch to discuss your requirements or arrange a site survey and quotation today. Additional office space can substantially increase the value of your building. The new area can be above a mezzanine or below, or on both levels. We have installed executive offices and board rooms, general office areas, training or showroom areas, as well as laboratories, clean rooms and CMM environmental enclosures. If you have enough headroom (probably 4.3m or greater), then we can increase your available workspace or office area without you having to move premises.